Barn Quilts are quilt blocks painted and hung on farm buildings or fences. The quilt blocks are often painted by the resident of the farm or home where they are displayed. The quilt blocks give tribute to our forebears who wasted nothing and were able to create quilts that were functional, but also reflective of the individual who created them. The Glacial Hills Quilt Trail was established in October of 2015. The trail currently incorporates barn quilt blocks in Leavenworth, Jackson, Jefferson, and Douglas counties. TCHS sponsors classes for those wishing to learn how to create their own barn quilt block. 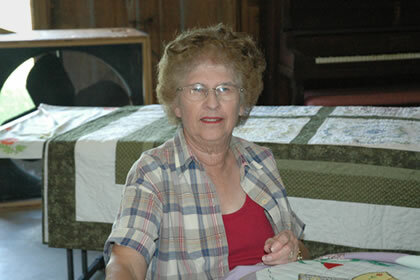 The barn quilt workshops are held twice a year at the barn, taught by Jean Pearson, with assistance from other members and friends of the historical society. The next Barn Quilt class will be held in Fall of 2019. Watch this page for the exact date. Or for more information, send an email to Jean at lloyd6970@att.net. The class fees include materials and instructions to create your own Barn Quilt Block. Patterns are available at the class or you can bring your own. The 2' x 2' and 4' x 4' blocks are MDO (medium density overlay) signboard, primed with an exterior paint. Exterior paints in many colors are available at the class. Arrive at 9:00am and walk out at 3:00pm with your own Barn Quilt Block. The fee for a 2' x 2' block is $50; the fee for a 4' x 4' is $100. Photos from the workshop on October 20, 2018 at the Fairchild-Knox hay barn at the Tonganoxie Historical Society. View our Barn Quilts and locations. The Glacial Hills Quilt Trail currently incorporates barn quilt blocks in the Leavenworth, Atchison, Jackson, Jefferson, and Douglas counties of Kansas. Interested in Joining the Trail? Download the application form and email the application form and a photo of your barn block in its permanent position per instructions on the application.